If you’ve recently got yourself a new laser tag set, then you’re likely enjoying yourself playing the basic game of laser tag. But, regular laser tag may only keep you occupied for a certain amount of time. After a while, you might want to look at playing different laser tag games. 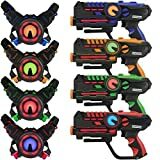 There’s a ton of different kinds of games that you can play, so if you’re getting a little bored with regular laser tag then it can pay to look into one of these other games. Some of these games might require that you need a little more space than you may have at home. If you need to, you can always head to your local park to play there games with your kids. Generally aside from your laser tag set, there isn’t a ton of other stuff that you’ll need. Playing Capture the Flag Laser Tag is probably the most commonly played alternative game to regular laser tag. It’s probably one of the most common games to play when considering shooting – you’ll often find it in paintball and airsoft, as well as in online video games. The premise of CTF is pretty simple – each team has a base that has a flag. This doesn’t necessarily need to be a flag, but it has to be something that the opposition team need to try and collect. Whilst protecting your own base, you need to try and get your opponents flag and return it to your base – without getting killed. If you get shot, that’s it – you’re out. It may seem extremely simple, but it’s definitely much more fun than it sounds. It’s best if you can have a minimum of 4 people when playing capture the flag, but usually it gets better the more people that are playing. If you want to play it properly though, you’ll need to go to a park or a big environment and spread out. Another cool game to play laser tag with in Convoy. It’s very simple, but it’s a great game to play if you have a group of 6 people or more. Split the 6 people into three teams of 2, or however many you need to play. Essentially, you have two people who need to get from a predetermined starting line to a finish line. In between the ‘Convoy’, the other two teams will be ‘ambushers’. They need to stop to convoy from getting from the starting line to the finish line. The game is over if any member of the Convoy makes it to the destination without getting shot – they can also win by shooting all the ambushers, but this is hard because there’s twice as many ambushers to shoot them. The ambushers win when all of the Convoy is eliminated. You can also play this game with a time limit, otherwise you might be waiting ages for the Convoy to get to their destination. This is one of my favorite laser tag games to play with your friends. You need at least three people to play Rabbit Hunter, but it’s much more fun if you have more people. Essentially, you have one person who is the rabbit, and the rest of the team are the hunters. You start a timer, and the rabbit has to see how long they can evade the rest of the players without getting caught. If they want to fight back they can – but the rabbit unlikely has much of a chance against a pack of hunters. This can be a super fun game to play with the kids, especially if you want a bit of a break. You can leave the rabbit to run for ages and only start hunting when you’re ready! Most people think that laser tag is generally based on teams. And if you go to a laser tag area, then you’d be right. But if you’re playing laser tag at home, you get the choice of playing a free for all. That means that if you have four people, you can have a 1 v 1 v 1 v 1. It doesn’t always necessarily need to be a team game. This is a good idea if you have young children, because it can help prevent them feeling like they are getting teamed up on. Although much of the basis of laser tag and other shooting sports are around it being a team game, sometimes it can be fun to split up. Last life is a good game to play if you want to spice things up a little. If you want to have an extended game of laser tag, then it makes sense to increase the amount of lives that you have. Essentially, Last Life increases the amount of lives that you have. This means that even if you get tagged, then you can continue to play – but when you’re tagged once, you cannot continue to shoot and you have to go back to the starting point. Another good way of playing last life is to limit the amounts of shots you’re allowed to fire. You can even do ‘One in the Chamber’ – meaning you only get one bullet to kill your enemy. If you miss, you have to run back to the starting point to get your ammo! Overall, there are a lot of other games you can play in laser tag if you’re getting slightly bored with the regular game. These are just a few suggestions, but there are more online if you want to do some research to find out more. With these suggestions, you should have enough to keep yourself occupied for quite a while!